Not sure which cocktail to make for your guests? Give them a choice of these seven: Whiskey Sour, Bacardi, Manhattan, Daiquiri, Martini, Tom Collins or Alexander. All with exact recipes including measurements. 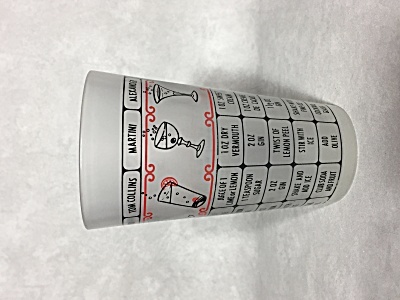 If you can read, well before the first round of drinks that is, you can mix up a great classic cocktail in this great classic cocktail mixing glass. I guess you could start with making a shaker full of one drink and see who is still standing when you get to the 7th recipe! I love the bold graphics done in red and black on the frosted glass. It pops!! Who wants to add it to their barware collection?